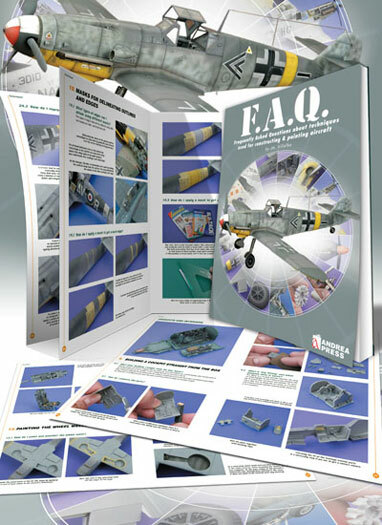 Conclusion: A great illustrated guide to building and painting scale model aircraft. I have always found aircraft modelling to be the most challenging aspect of our wonderful hobby, and I have sometimes struggled with it. When I saw this book I was therefore very keen to see if it might be able to offer some useful hints and tips. Andrea Press has already delivered two "F.A.Q." books - the original on armour modelling by the well-known Miguel Jiminez (Mig), and one on figure modelling. This new addition covers construction and painting of model aircraft. The soft cover book contains 159 glossy pages, all with multiple step by step photos and explanations. There are 39 chapters and a wonderful gallery at the end. Each of the chapters covers different topics in logical order, so if you were to build a kit, you could use the book as a guide from start to finish learning as you go. Whether you are a beginner or an advanced modeller, I think you would gain from this great publication. I know that I will, and hopefully soon you will see a kit from me using techniques learnt from these very pages. A very useful book recomended to all.